In the lead up to the Commonwealth Games next year, South Ayrshire Council’s Active Schools Team, supported by Sport Development and Community Sport Hubs, has presented three Legacy Events in Girvan, Ayr and Troon, to improve local awareness of the Games and offer local communities the opportunity to try different sports and take part in sport and physical activity. 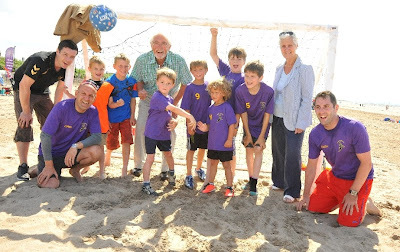 The events bring together young coaches, young ambassadors and sports leaders who have all taken part in the Council’s Active Schools programme in school – and, in the continued superb summer weather, Troon beachfront hosted the last of the Legacy Days on 27 July. It featured rowing, sailing, football, petanque, badminton and athletics and more – and gave visitors the chance to meet some of the superb young sports coaches and ambassadors who have worked behind the scenes to deliver the series of successful Legacy events. In addition, a special event, part of The Scottish Beach Volleyball Tour, was organised by Troon Volleyball Club and had beach-goers lining up to watch, with no shortage of requests to take part! Younger children enjoyed face painting and DJ Jen McGinlay had people dancing on the sand, with nearby catering helping to satisfy the appetites the sports and activities had helped to work up! The free events were part of Games for Scotland’s programme, designed to inspire, motivate, engage and engender pride in the people of Scotland in the run-up to the 2014 Commonwealth Games. Managed by EventScotland, Games for Scotland they formed a key part of the Scottish Government's commitment to deliver a lasting legacy as a result of the Commonwealth Games coming to Scotland. For those who took part in Girvan, Ayr and Troon, it was a sizzling summer of sport to remember – all in the lead up to the Commonwealth Games next year! A set of downloadable photographs taken at the Troon event are available on Flickr. CLICK HERE.